The moonshine consists of special containers that you can heat up, hoses that will be supplied and discharged water, and serpentine. For moonshine good coil means a lot – it depends on the performance of the device. If you want to make it with their hands. The coil in the moonshine needed in order to cool the heat released by Braga pairs and turn them into a brew. The better built device, the faster it turns to cook the right amount of alcohol. To make their own coil, you will need an appropriate size tube. The coil has another name – the refrigerator Graham. In operation, the apparatus of the pair from Braga congenerous it, and then is cooled. For this purpose, the coil is immersed in cold water. To make the coil, you will need a tube with a diameter of 10-12 mm, the wall thickness of which is 1 mm and length of about five feet. An important parameter is the material – it needs to be, firstly, non-toxic, second, do not react with alcohol-containing products. He also needs to have good conductivity. For coil the most suitable materials – copper, silver, brass, aluminum, stainless steel. 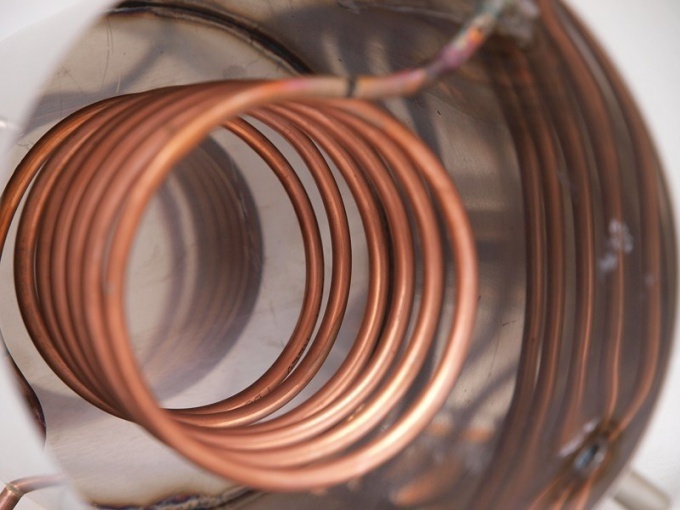 The most affordable materials can be called copper and aluminum, but the copper conductivity is better. When choosing tubes, copper, keep in mind that occasionally it is necessary to clean and replace. On a copper surface over time formed a black coating due to sticking of sulfur. For cleaning you can use the following recipe: a tablespoon of citric acid diluted in a liter of warm water. In the resulting liquid, immerse the coil and wait for a bit. Usually after twenty minutes, the RAID is normal clean. If you thoroughly clean the coil did not work, dissolve in a liter of water a teaspoon of baking soda and this solution leave it for the night, after which everything is easy going. If you make a Perm tube in a spiral with your hands, it is necessary to prepare. Fill the tube with dry fine sand to during the Curling she collapsed. One side of the tube should be closed – for example, to drive there Chopik wood. Put the tube vertically and fill it inside the sand using a narrow funnel. The tube it is necessary to periodically hit some solid object to get a better seal everything inside. After filling, drive in the second Chopik, to the end of the tube was left open, or at the time of iron sand from her sleep. As mandrel you can use a steel pipe of suitable diameter. The pipe is necessary to clamp in a Vice, then wrap it around the prepared tube to spiral. Refrigerator Graham ready.